It’s about time that you do something creative with your coffee mug. Don’t you feel bored of having the same coffee daily in that mug? Did you know you can actually make cakes in your coffee mugs? 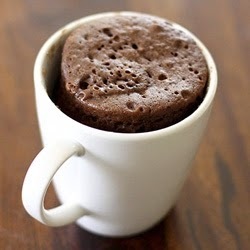 Here’s a fantastic quick fix Chocolate Mug Cake recipe you can use to bring a sweet twist to your regular coffee routine. 1. Mix all the dry ingredients and pass it through a sieve to ensure consistent texture. 2. Add milk and oil into the dry ingredients and mix rigorously to get a smooth batter. 3. Fill up the coffee mug/ Styrofoam cup with batter reaching half the size of cup. 4. Add chocolate chips/ chocolate shaving/ dairy milk pieces on the top. 5. Microwave the mug. It takes 1 min and 10 seconds in my microwave. Should take maximum 1 min 20 seconds. Time may vary depending upon the voltage. Best trick is to wait till you see steam and smell of hot brownie coming out of microwave.